“Hope Rising” from Christian Faith Publishing author R.M. Janoe is a powerful page turner that tells a story of steadfast belief in times of adversity and tribulation. “Hope Rising”: a gripping account on understanding life’s purpose and the idea that things happen for a greater reason. “Hope Rising” is the creation of published author, R.M. Janoe, a retired US Navy veteran with twenty years of service; he is now a full-time writer, loving husband and father. Life is unpredictable and private detective Aiden Rising’s life is no exception as he takes on what he believes will probably be a simple case. As his investigation progresses he is joined by an unlikely group of allies as they discover that nothing about this case is simple and that the true intrigue is deeper and more sweeping than they would have imagined. Published by Christian Faith Publishing, R.M. Janoe’s new book lets the readers dive into the world of the supernatural, complimented by themes of intricate machinations and schemes worth reading. 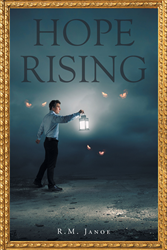 Set in Skagit County, Washington, and the surrounding area, “Hope Rising” is a thought-provoking tale of truth, faith, and strength, that tests the limits of one’s preparedness mentally, physically, and spiritually, as opposing forces of good and evil vie behind the scenes for the souls of humanity. When these supernatural schemes mix and mingle with human intentions and desires both catastrophe and miracles result. Will faith be strong enough to prevail in such an overwhelming battle? One can only hope. View a synopsis of “Hope Rising” on YouTube. Consumers can purchase “Hope Rising” at traditional brick & mortar bookstores, or online at Amazon.com, Apple iTunes store, Kobo, or Barnes and Noble. For additional information or inquiries about “Hope Rising”, contact the Christian Faith Publishing media department at 866-554-0919.